Getting out of the ground is one of great unknowns of self building. 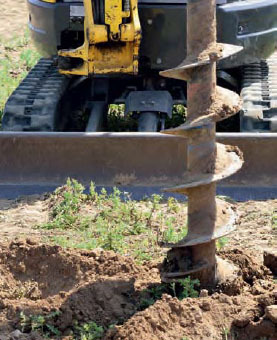 The fact is, you can never be entirely certain what lies below the surface before you’ve dug the foundation trenches – and if any problems are going to affect your project, they’re likely to happen at this stage. The good news is that most of these issues are surmountable; and if you can identify them in advance, you should be able to solve them relatively cost-effectively. Given their buying power and political clout, the major housebuilders tend to have first pick of the plots. They’re keen, unsurprisingly, to skim off the choicest examples – namely the level, easy-to-develop sites that, as far as they can identify, aren’t likely to fall foul of planning or practical issues. This could change with the advent of the Right to Build (see page 62 for more on this) but for the time being, the status quo remains and self builders tend to get second dibs. That’s not to say there aren’t great sites out there – and indeed many developers won’t even consider sites of the size that might only support a single bespoke home. What’s more, some plot features that a big developer might label as problems may actually offer interesting opportunities for self builders. 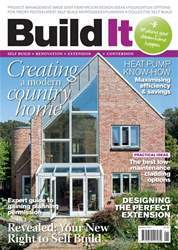 Build It magazine’s January issue is packed with detailed practical advice & inspiring projects to help you create your dream home. Here’s a taster of what’s inside: •	Stunning contemporary oak frame home (page 22) •	Revealed: your new right to self build (page 62) •	The best low-maintenance cladding options (page 69) •	Running an air source heat pump (page 80) •	Expert guide to gaining planning permission (page 94) •	Designing the perfect extension (page 106) … and more!